"If we consider a microscope to be an instrument by which we can observe objects or parts of objects which are too minute to be visible to the naked eye, and which can be used to investigate minute structures of plants or animals, and thus bring to our knowledge facts not otherwise ascertainable, then the microscope is a comparatively modern invention and dates back only to about the end of the sixteenth century. If however, we are to include the ability to magnify items that are already visible to the naked eye, then we would have to go back to the Egyptians who knew and practiced the art of cutting a polishing stones. From the Egyptians this art was extended to the Greece and Italy. The earliest writing describing the action of the lens appears in the writings of the Arabian Alhazen (962-1038) described in his "Optics Thesaurus Alhazeni Arabius Basil." It was not until much later in the 13th Century references to lenses began to appear on a regular basis. Roger Bacon (1214-1292), a monk in Oxford, wrote on the topic of Nature often referenced the concepts and use of lenses. Indeed Bacon knew of lenses and their abilities. However the type of lenses he talked about would be laid on books or held in the hand just above the printed text. Bacon may have even known of, or predicted the invention of the telescope based on his quote below. "for it is easily seen that the greatest may appear the least and the contrary, and far distant things may appear very near and conversely . So we may even make the sun, moon and stars descend lower in appearance, and to be visible over the heads of our enemies, and many things of the like sort which persons unacquainted with such things would refuse to believe." Like much of the history of optics, there are many reports about spectacles, but most put the invention around 1285. The grave of Salvano d'Aramento degli Amati a nobleman of Florence has a statement that he invented spectacles, but kept the process a secret. Alessandro della Spina of Pisa who died in 1317 had an inscription on his tomb that he had discovered how to make spectacles (possibly from Amati) and had made the method known. Yet another monk, Giordino da Rivalta, who died in 1305 said that making glasses was one of the most useful arts and that it was only 20 years since its invention. He also said he knew the inventor (1285). Why such a long delay between the development of lenses and the invention and use of spectacles? One answer is that church doctrine did not allow for man to alter what God had created. Again, there are various accounts of people inventing the telescope. Bacon's famous quote could lead one to believe that such an instrument was available in the 1200's. In fact, there are several names that are listed as possible inventors, Leonard Digges and William Bourne to name a few. The usually accepted date for the invention of the telescope is 1608. It is based on a letter from Jacob Adriaanzoon (also called James Metius) to the States General, in which he asked for exclusive rights to sell an instrument he had invented by which distant objects appeared larger and more distinct. This date is further documented by Descartes in the first chapter of his book "De Lumine," (1637). He writes about Metius and his instrument that used convex and concave glass positioned at the right distance at the ends of a tube to magnify objects. Many people think of Galileo when talking about telescopes. In fact, in 1609 Galileo did hear about and designed his own telescope that included both convex and concave lenses. Galileo made many astronomical discoveries including the moon of Jupiter and the phases of Venus. Helped the Medici family to even more wealth with the use of his telescope? Fact or fiction? Also got in trouble with the Church. It was to Christina of Lorraine the granddaughter of Catherine de' Medici that Galileo wrote his letter on science and scripture, "Letter to the Grand Duchess Christina of Lorraine." Here the accounts are less hazy, but a cloud of controversy does still exist. Based on the letters of William Boreel ( the Dutch envoy to the Court of France) the father and son team of Hans and Zacharias Jansen are the inventors of the microscope. At least they are the first to have any documentation that substantiates such a claim. Their microscope design was somewhat limited. 1665 - Robert Hooke (the Secretary of the Royal Society) publishes "Microgphia" a folio of thirty-eight copper-plate illustrations of objects drawn with the aid of his microscope. First to describe and coin the phrase "cell" when observing a slice of cork (bark from an oak tree) using a microscope power of 30X. 1673 - Antony van Leeuwenhoek a tradesman of Delft, Holland with no formal training made some of the most important discoveries in biology. He discovered bacteria, free-living and parasitic microscopic protists, sperm cells, blood cells and more. All of this from a very simple device that could magnify up to 300X. It took until 1839 before cells were finally acknowledged as the basic units of life. Nearly two centuries! 1823 - Achromatic lenses introduced now provide resolution of 1 micron or 1/1000 mm. 1839 - Theodor Schwann and Matthias Schleiden formally propose the "Cell Theory." 1840 - Donne' publishes the first micrographs in France. This touches off a debate over the merit of micrographs versus microscope drawings. ~1880 - Microscope lamp with filters. August Kohler had worked out light source and condenser position to obtain the best image projection. 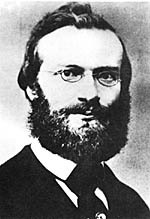 1873 - Ernst Abbe published his work on the theory of the microscope. Up to this point, much of the design of microscopes had been trial and error. 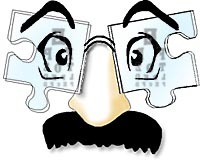 He made clear the difference between magnification and resolution and criticized the practice of using eye pieces with too high a magnification as "empty magnification." His widely used formula to calculate resolution is based on his wave light theory. It was at this time Abbe began to collaborate with Carl Zeiss which lasted until his death. Also started one of the first medical insurance funds, pension funds and introduced the 8 hour work day. 1873 - Ernst Leitz microscope is introduced with a revolving mount (turret) for 5 objectives. 1879 - Walther Flemming discovers mitosis. 1878 - Introduced oil immersion lens (cedar oil) that resulted in a homogeneous optical path. ~1880 - microtomes begin to appear for sample preparation. Up to the point specimens were by sharp knives. 1886 - Ernst Abbe designs apochromatic objective that brings red, yellow and blue into one focus. These lenses required 10 or more elements. With this final advancement the theoretic limit of resolution for visible light microscopes had been reached (2000 angstroms). 1880-1900 - Louis Pasteur and Robert Koch both become engaged in microscopy and the study of bacteria. 1904 - The first commercial UV microscope by Zeiss. The resolution based on Abbe's formula is twice that of a visible light microscope. 1930 - Fritz Zernike discovered he could view unstained cells using the phase angle of rays. It took until 1941 to bring a commercial microscope to market. Zernike visited the Zeiss factory in 1932 to present his method. After reviewing Zernike's method an older scientist said; "If this really had any practical value, then we would have invented it a long time ago." In 1953 Zernike was awarded the Nobel Prize for his phase contrast work. 1931 - Max Knoll and Ernst Ruska construct the first electron microscope. 1933 - Ruska builds the first electron microscope that exceeds the resolution of the light microscope. It has an accelerating voltage of 75 kV. 1934 - First electron micrograph of a biological sample. long-leaved sundew fixed with osmium. 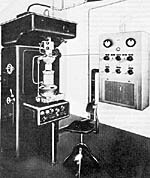 1937 - First scanning electron microscope is built. 1939 - Siemens supplies the first commercially available electron microscope. Ultimately the power of the electron microscope was not realized until the 1950's when ultra-microtomes were built. 1951 - First ultra-microtome built by Porter and Blum. These instruments could slice (section) pieces of biological materials as thin as 500 angstroms (angstroms = 10-10 meters). 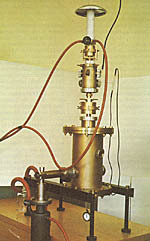 1982 - Scanning Probe Microscope is invented and works by measuring current. 1986 - Atomic Force Microscope is invented and measures force instead of current. 1968? - First silicon-based processing chip for computers is made. Clay, R., Court, T., The History of the Microscope. Holland Press, 1975. Hartley, W.G., The Light Microscope: Its Use and Development. Senecio Publishing Co., 1993. Ford, Brian J., The Leeuwenhoek Legacy. Biopress and Farrand Press, 1991.